Chester County’s new cash crop. 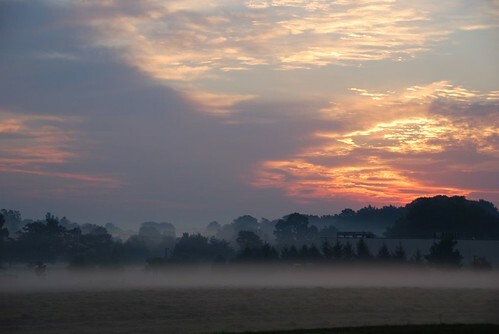 Photo of Chester County by Lobberich used under a Creative Commons license. Witold Rybczynski, Last Harvest (Scribner, 2007). The author, an architecture critic who teaches at Penn, tells the story of the creation of New Daleville, a residential subdivision in an exurb of Philadelphia, from the purchase of land through design and building to the arrival of the first residents. Rybczynski was given terrific access, and he has used it to tell an engrossing story about how farmland gets transmogrified into homes. New Daleville was designed in a new, “neotraditional” style, so this account will appeal to fans of the new urbanism. New Daleville is located in Cochranville, Chester County, about 45 miles west of Philadelphia and half that distance northwest of Wilmington, Delaware. This is at once a story of what happened to a very specific place, and an explanation of what happens all over the country. For more on Rybczynski, here are Wikipedia, his own site, his blog, and his bio at Penn. He was given the Vincent J. Scully Prize by the National Building Museum. Take a look at the book on Google Books. On Slate, Rybczynski offered this slideshow of New Daleville’s evolution. Penelope Green (The New York Times) gives a good sense of how the book unfolds. Brendan Crain (Where) says it’s enlightening if you want to understand why today’s suburban developments look the way they do. Crain interviewed Rynczynski as well. Rob Goodspeed sees omissions, but calls it complex, compelling and accessible. Patrick D. Hazard (Broad Street Review) appreciated the explanation of the tasks of preparing land for builders to use (or here). John Cruz says it gives a good view of why these kinds of developments are built. Pratik Mhatre calls it easy, refreshing, and non-polemical. Peter Holland says it’s an easy read that integrates the complexities of the development process (.pdf). Dorn Townsend calls it a masterly story of entrepreneurship. Chris Bradford sees relevance to Austin. Henry Petroski (The New York Sun) calls it a primer on the aesthetic, economic, historical, physical, political, psychological, and structural aspects of the business of real estate. Andrew Ferguson (The Wall Street Journal) lauds Rybczynski’s storytelling. Mike says it’s a fun read. One nameless but conservation-minded blogger says it’s as much about the characters as it is about the place. It softened Brasilliant’s strong opinions against “neotraditional” planning. Joshua Kim gives it an A. Tom Lindmark calls it a wonderful little book. Listen or read this interview with NPR’s Debbie Elliott. Watch Rybczynski talk to BusinessWeek’s Diane Brady. Listen to his appearance on WNYC’s The Leonard Lopate Show. Here’s the builder’s page. Tim Halbur says the development is failing. Decide for yourself: To find real estate listings in the development, go to Zillow and search for “415 Wrigley Blvd, Cochranville, PA,” which is in the middle of what Zillow calls Daleville.